Hello and welcome to my website and blog! My name is Olga. I specialize in creating patterns for historically accurate and detailed outfits — historical as well as contemporary. I sew, knit, crochet, embroider and cross-stitch, among other crafts which I learned to do when I was little. 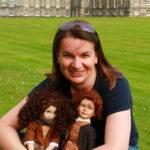 I returned to dolls when my eldest daughter was 4. What started as a hobby 10 years ago has since evolved into a full-time business. And I consider myself lucky because I can do what I love! historically accurate outfits with lots of details. I am passionate about the history of fashion so my patterns are always thoroughly researched and I try not to do any shortcuts unless absolutely necessary. 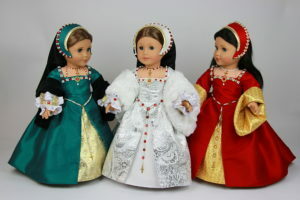 Patterns marked with a «Historically Accurate» stamp are as detailed and historically correct as possible on the doll scale (with the correct seams placements, etc.). occasional contemporary outfits with an impeccable fit which makes dolls look slim and elegant. detailed and well scaled knitted doll sweaters, cardigans and alike, which usually require knitting needles in smaller sizes (1.5mm and 2 mm). 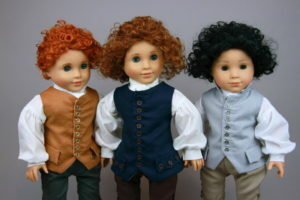 My favourite models are A Girl for All Time, American Girl and Carpatina boys dolls. 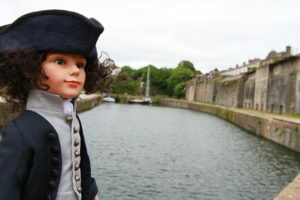 I also occasionally make outfits (and patterns) for WellieWishers and H4H dolls, Sasha, Gotz, Zwergnase Junior, Tonner dolls and some BJDs (mainly Iplehouse). My favourite historical periods range from the Middle Ages to the late 1860s, with the particular interest in the Tudor era in England, the whole of the 17th and 18th centuries in England, Scotland and France, and 1830s and 1850s in England. 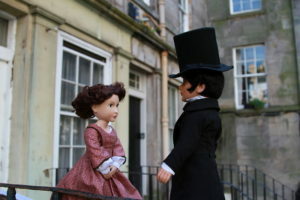 I also love having fun so I bring my dolls on my travels and take a lot of photos which I then share with you all on my blog. Lots of my outfits are inspired by my favourite TV series and books. 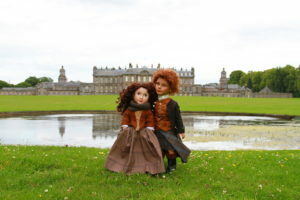 In the last few years I have taken my customized dolls to various TV series filming locations in England, Cornwall, Wales and Scotland. Please feel free to contact me if you have any questions or suggestions. I would be happy to hear from you!